Send 12 Yellow Roses Bunch to Chennai. Gifts to Chennai. Send Flowers to Chennai. Description : Gift2Chennai.com has arranged this mindblowing yellow roses bouquet to send on any occasions or events. One Dozen Yellow Roses decorated with green leaves, say in a very special way that you love and care. 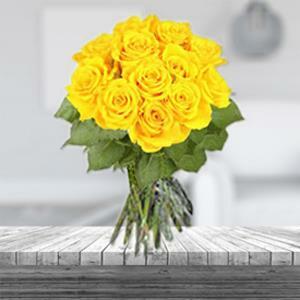 Send this captivating yellow roses bouquet to Chennai and give words to your truest emotions. You may also try our service and send Gifts to Chennai on a special occasion.